When friends find out I work in recruitment they often have a lot of questions. They might ask for funny stories, the strangest applications I've seen, but it's never that long until I'm asked if I'll look at their own resume. Sad though it may seem, I don't mind doing this, actually I quite enjoy it. Almost every time I've done this I hear the same justifications for formatting, length, and content come up again and again. I'm sure that this advice is always given with the best of intentions to those seeking jobs. It's folksy, friendly and given in the same tones as the motherly maxims we were fed as children. However, times have changed. We know that if we pull "that face" we won't stay that way, we know that eating those crusts didn't put hair on our chests, we even know that if you swallow chewing gum it wouldn't "wrap around your heart and kill you" (my elder sister used to tell me this with absolute conviction). So much of this weird advice is now dismissed and yet when it come to job seeking we hold certain things to be absolute truths. Here are seven thing people blindly accept as the "right way" and the reasons I think we can now give up on them. Myth Number 1 - "Your resume should only be 1 page." Truth - This is one of the most pervasive pieces of advice I hear. Often I find people struggling to fit their experience on a page, resorting to 10pt font size or self-censoring and leaving some great things out, desperately attempting to make everything fit into no more than two sides of A4. The problem with that? 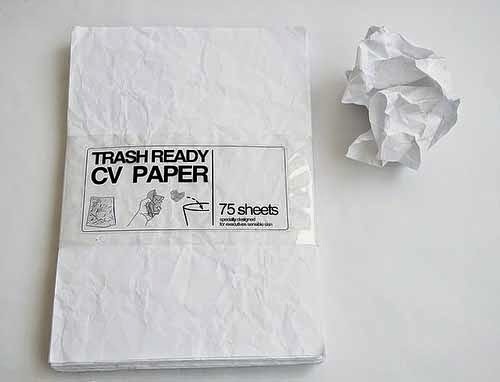 I will probably never print your resume. "Sides of paper" is a physical restriction that modern ATS's (Applicant Tracking Systems) and candidate tracking systems have made redundant. The truth is that I will scroll through a CV on a screen, normally in a frame within another application, I'll be reading your resume not counting pages. Some recruitment software even removes page breaks so the length is purely a measure of holding a recruiter's interest. Write interesting, relevant content and a recruiter won't mind if you add a page. Myth Number 2 - "Avoid all complicated fonts or design elements." Truth - This is another of those things that was potentially true in the past. When looking at a paper resume it may have been the case that in printing a complex design would be corrupted in some way. Similarly, early ATS's couldn't cope with any design elements as they tried to parse documents and strip out information. Any modern system will now happily display submitted resumes in a variety of formats, even as beautifully crafted .pdfs the better systems are now advanced to the point where they can do this and still strip out information and enable searching. Never has this advice been so misplaced when I was recently looking for designers. The number of standard template resumes I received was scary - if you're a designer show it! If the design you send to a recruiter is overly complex and doesn't convey information clearly it will tell them a lot more about your abilities than the content. Myth Number 3 - "Recruiters only spend 5 seconds looking at a resume." Who the company are, what they do - just a couple of sentences. Achievements in the role - Call attention to specific things that match the role you're applying for or experiences you want to call out. This makes for easy reading, it tells me what you did, and how you did it. I don't have to second guess obscure job titles and still offers you the chance to blow your own trumpet a little. Myth Number 4 - "Use Bullet Points." I like bullet points, when listed the duties you undertook or telling me about specific individual elements of a whole they're great. However, not everything should be bulleted. I've seen resumes that are so clipped and hammered into bullet lists that they are no longer comprehensible. As a rule any stylistic choice should enhance legibility. If a resume is comprised totally of bullet points, each with their own clipped structure it can be like reading a newspaper using only the headlines. I'll thank you for the brevity but I'll also doubt your ability to write a complete sentence. Myth Number 5 - "Identify the problems of the employer." Truth - Don't do this. I've never seen an example of this that doesn't sound arrogant. I can't imagine a case where it wouldn't. Cite relevant experiences, give examples that you think may resonate with the problems that your target employer would also face, but the assumption of a candidate leaping in and saving the company they are applying to work for is a turn off for most recruiters I know. Myth Number 6 - "Don't use jargon." Truth - Don't dumb down your resume to the point that it looks as though you don't know what you're talking about. This is particularly true for technical professions. A candidate is correct to assume some level of knowledge from the recruiter who is reviewing the resumes before they reach a hiring manager. If a developer or sys admin is giving more details about a project they worked on I want to to know what technologies they used. There's another reason to keep in the technical terms too - they are often how resumes are searched and candidates are discovered in the first place. In any database of resumes, LinkedIn included, search is initially about filtering millions of people through key words - they have to be there. Technical terms are not meaningless, include them. Don't include the truly meaningless, clichéd company specific terms or management speak but if the term is relevant and needed don't be afraid to use it. A good recruiter can either be relied upon to google the term or if the rest of the resume is good they'll ask you. Myth Number 7 - "Don't add your hobbies or interests." Truth - As a recruiter I tend to see all candidates as meaty flesh bags containing a skill set, their only possible use being to serve the organisation for which I currently ply my trade, said no one ever. An organisation that would discriminate against you for your hobbies or interests probably isn't one you would want to work for. However, there are some people who may have legal yet contentious pastimes. Things that might not be a good idea to add are religion or political activity or hunting as an example. It's important not to give the recruiter a reason to reject your application out of hand but at the same time as a recruiter I'd still like to know you were a well rounded human being. In a related area, don't make up hobbies or interests, recruiters will ask you about them. There's nothing more awkward for us both like a sudden improvisation about your made up live action role-playing experiences. fishing the past from the disposal, wiping it off, painting over the ugly parts and recycling it for more than it’s worth". The next time that someone offers you some advice on your resume make sure that it really applies to the application you're making, but this is just my advice. Nick Marsh of Makeshift recently introduced the term Talent Hacking. His contention was that hiring was broken and there existed a movement towards a new way of thinking. How did it come to this? Why is it that the world of recruitment can be called out as broken with no argument to the contrary? Long ago in the mists of time and still the case at some less progressive organisations, recruitment was owned by HR. From behind the dull-warmth of privacy screens and bloated software that referred to people as resources, recruiters began to stir. Often regarded as the "noisy ones" on the HR floor, recruiters slowly began to emerge and be recognised as having a legitimate skill set. A skill set that was distinct from their agency counterparts and yet not in keeping with the silo'ed silence of HR departments. Moreover it was a skill set that was distinct from those of the HR generalists. Over time the recruiters in more progressive organisations moved further away, diversified further and were allocated distinct budgets. The dual pressures of speed from the business and for frugality from the finance department meant that in-house recruiters had to adapt the way they worked and began to become introspective - there wasn't just one skill of recruitment but many. The role of a recruiter has been split in many organisations and so to reflect this and also to highlight there particular skills there are now many different job titles in use - from Sourcer, Headhunter, through Talent Acquisition Specialist, the Orwellian sounding Staffing Officer to Talent Scout there seems to be a new way to describe yourself each day. So is "Talent Hacker" doomed to become the next in a long list of buzzword-like titles? Hopefully we can avoid the pitfalls of buzzwordism if we make a clear distinction as to what a "Talent Hacker" actually is. Firstly, I don't believe it's a job title at all. Talent Hacking is a methodology. At best it's a philosophical stance taken by a recruiter to adapt and experiment and at worst it's the sharing and usage of a number of disparate tools to expedite hiring. In Nick's original article I was quoted as saying that “Hiring is still waterfall in an agile world”. What I meant by that is that a "traditional" hiring process is slavish in adherence to accepted dogma. A job description is produced, it's disseminated through advertising channels, resultant applications are pushed through a pre-defined process and those lucky enough to have impressed will be hired. In this process, there is no feedback, no learning and no space for creativity...worst of all there is no scope to delight the candidates. Too often in large recruiting organisations the pressure to maintain robust process and measure the performance of recruiters in the organisation means that we lose sight of the reason we're all there in the first place. Measuring and rewarding things like number of candidates contacted or the number of contacts who made it to second stage is good practice but if the team isn't hiring it's all just "busy work". A robust and fair (free of bias) process is important. Processes are ways of doing things that are more efficient - they must make a workload easier to complete or faster, you can think of them as collections of efficiencies. If they do not add benefit they are no longer of value. A lot of larger organisations hang on to process as though it was a life raft in a rising ocean of change, once the process is no longer effective (which you should periodically test for) abandon it and find a new more effective process. A point here on "Best practices", to paraphrase Mary Poppendieck, author of "Lean Software Development" - Best practices are solutions to other people's problems that you may not have. So much of the processes of recruitment are done simply because "it's how we did it at x company" or worse still "it's how I've read x company do it". Process is great to ensure a level playing field and to expedite the flow of a candidate towards being hired - if it isn't doing either of these things it should be questioned and if found to be lacking changed. The Talent Hacking approach loves data. Sourcing, screening and shepherding a candidate towards being hired calls for a lot of decision making. Decisions are better when supported by data. Even if you cringe or break out in hives whenever someone says "Big Data" there is little doubt that the digital exhaust trails that people now leave behind them have made them easier to find. Ask a tame recruiter you know if they can find your email address, I'll bet they can and it won't be from anywhere you remember writing it... Data supports a hiring plan, salary benchmarking, advertising response rates, recruiter performance, process improvement - it's all around us as recruiters. Building a living breathing data set from which you can answer the future unknown questions will be one of the best investments for success as a recruiter. Even better, a recruiter's standing in the business can be improved from the simple provision of the raw data. The Talent Hacker will go further and provide insight to hiring managers - affecting change and having a direct effect on the success of the business. It is the data that will enable the wider business, as consumers of the recruitment service, to answer the all important "Why?". Why do we value this more than our own anecdotal evidence? Anecdotal evidence is only ever the outcome of a single case, often it informs a bias or shapes action in a way that may have been right in a prior instance but not for the current one. A Talent Hacker loves to hear the anecdotes of others because in unpacking them you can ask those questions that reveal what is "true" to an individual. They do have value, but I'll take the data. Beyond external marketing and websites, a recruiter is often the first human interaction anyone has with a company. When they are doing their job well they are exemplars for the brand - impassioned spokespeople it's their enthusiasm that will bleed through in both their communication and deeds. So many recruiters at large organisations are a product of their environment they hide behind turrets built from template emails, missed phone calls and a fear of feedback. An in-house recruiter walks a tightrope between advocating for the candidate and for the company at the same time, straying too far in one of these directions will not be beneficial. A Talent Hacker takes a third position. We must be aware that the talent war is over and that talent won. Too many recruiters want to take an aloof position leaning towards the institutional arrogance that permeates some companies - "we don't have to provide feedback", "you're only worth a bland template email", "we have hundreds of candidates". I'm sure this was a perfectly reasonable stance to take...until it wasn't. You only have to look at Glassdoor.com to see reviews of interview processes that call out companies for their broken internal communication, ignorant recruiters and interminable, arduous processes. For the Talent Hacker reading Glassdoor reviews is like a family owned restaurant being reviewed on TripAdvisor, scary as hell and a potential powder keg. A recruitment process should feel like a personal service, the realisation that organisations are no longer all powerful and that bad reviews will stop people from applying hasn't fully permeated a lot of companies. As humans we love to share, and embellish, a juicy story of bad service and this penchant for negativity can be mitigated by a recruiter doing their job well. Recruiters should protect their employers they do have a duty to them, but if it comes at the neglect of hundreds of individuals whose only crime is to have applied for a job then it might be wiser to limit the damage and stop recruiting altogether. In life there are always events that are outside of our control. As a recruiter we are often either privy to insider information or at the mercy circumstances outside of our control. From hiring freezes, through acqui-hires to redundancies there are many business events that impact a recruiter. The Talent Hacker must be aware of this and work hard to ensure that all parties, hiring managers, team, wider business and candidates are given the information where appropriate. Working at the coal-face of recruitment often turns up interesting information that could be of great use to other areas of the business, if you don't forge these feedback loops you are effectively losing out. It can be simple things like competitor hiring strategy or market rates rising in demand for a particular skill, however it can also be large and impactful learnings that should be used to adapt and change strategy - mass redundancies at a competitor, a new product launch or even rumours of mergers and acquisitions, candidates reveal a lot of information that could be useful - not listening to this let alone not reacting to it is missing out. Change can be a valuable tool and resistance stemming from traditional models of yearly planning can only leave an organisation exposed to risk. A company I once worked for lost 32 senior developers within three months - did they stick to a static hiring plan? Of course not! ...but the changes shouldn't have to be that drastic to trigger a period of re-evaluation. The Talent Hacker doesn't seek to control but instead knows that change will happen, they are not wedded to alternate contingencies but rely on experiences to suggest different paths to follow if the need occurs. I like the appreciation of a new wave of recruitment thinking. There have been pockets of genius in the underbelly of the people hunting game that have been hidden for too long. From the boolean greats who sift through data to find that one unknown diamond of a candidate to the recruiters who do so much more than their remit, trusted advisors to candidates, hiring, housing and relocating their candidate's families and pets as they go. 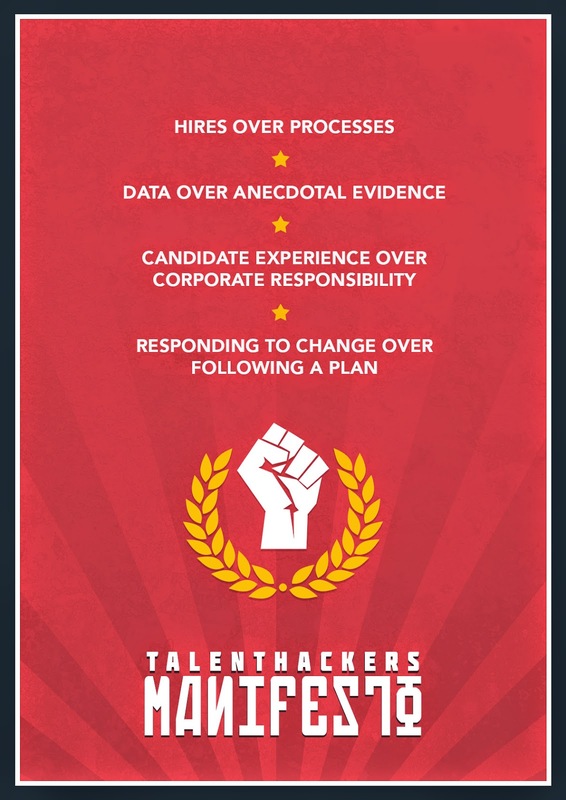 Perhaps the Talent Hacker flag is one we can all unite under, recruiters and candidates might be all the better off for it. This manifesto is by no means an exhaustive list of what is to be a Talent Hacker and I welcome input to clarify the definition further. By offering a definition we can at least trigger the debate and hopefully give the label more meaning.